1 of 1 In a small serving bowl, stir together yogurt, peanut butter, raisins and cinnamon. 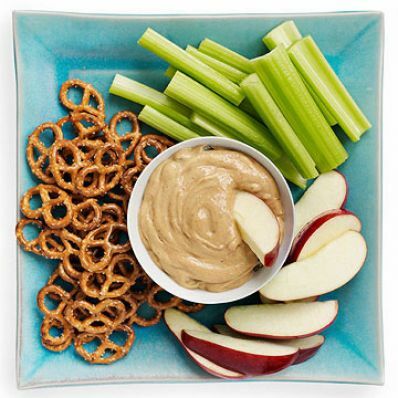 Serve with apples, celery and pretzels. Per Serving: 43 kcal cal., 40 mg sodium, 0 g sat. fat, 0 g fiber, 2 g Fat, total, 1 mg chol., 2 g pro., 4 g carb.